The eight episodes of the series are titled: “Off to Wisconsin,” “Moochie’s Escape,” “The Trouble with Pigs,” “The Runaway Tractor,” “The Case of the Deadly Paint Brush,” “The Turning Point,” “The Kids Take Over,” and “The Storm.” The Wisconsin filming involved 29 cast members which included 14 local 4-H members. The advance crew, with four large trucks from the Burbank studio full of generators, cameras, kleig lights, costumes and props, arrived at the Sisk farm, overlooking the Sugar River, on June 4, 1956. Filming for the farm scenes commenced the second week of June, and wrapped up June 29. In the series, Jim McCandless and his wife have two teenagers, Jimmy and Linda, and little Moochie, plus their handyman, Paullie, who’s a bit of a character. 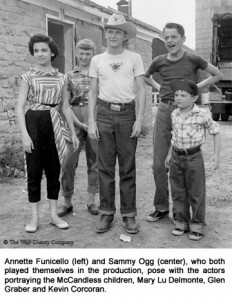 Sammy and Annette take to their hosts right away, and soon settle into the routine of farm life. They meet Moochie’s pet chicken, admire Mrs. McCandless’s flower garden, and are amazed to see how Paullie yodels to call the cows into the barn for the night. Jimmy shows Sammy the machinery used for automatic cow milking, and they watch the local veterinarian cure a calf made sick by eating paint from Moochie’s forgotten brush. At a local 4-H meeting they try dancing the polka and enjoy the European folk singing. 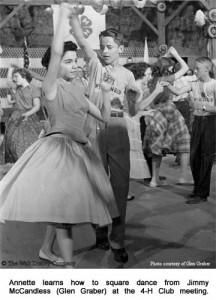 The 8-program series originally ran on Disney in November of 1956, during the second season of The Mickey Mouse Club. Touting educational programming, one of the program features was to be an ongoing set of serials examining future careers for kids and the daily lives of those following such careers. The first series was about airline careers, “American Pilot, Airline Hostess,” sponsored by TWA. 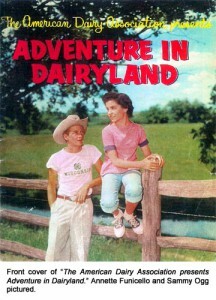 The American Dairy Association sponsored the second series. At the behest of the ADA the series was filmed in color, the only original production for the Mickey Mouse Club that was. Disney stopped showing the series on The Mickey Mouse Club after the 1958-59 season and the film rights then transferred to the American Dairy Association, who made the series available to schools, 4-H and other interested groups through the Education Film Library Association for several years.. ADA also published a 16-page, color, storyboard booklet, “Adventure in Dairyland,” which was distributed free of charge.